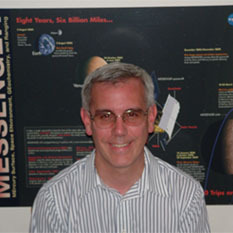 James "Jim" McAdams is the MESSENGER Mission Design Lead Engineer at Johns Hopkins University Applied Physics Laboratory (JHU/APL). He was also on the mission design team for the Near-Earth Asteroid Rendezvous (NEAR) mission. McAdams is a member of APL's Principal Professional Staff. He holds an M.S. in Aeronautical and Astronautical Engineering from Purdue University.